► Orange Peel powder, made from grinding dried orange peels, is perhaps the healthiest and the best source of vitamin C. It is also rich in flavonoids which help prevent chronic conditions. Orange Peel powder is loaded with nutrients and is considered to be highly beneficial for skin care and for overall well-being and good health. Orange Peel Powder is used by chefs and spice enthusiasts to flavor food, candy and liqueurs. 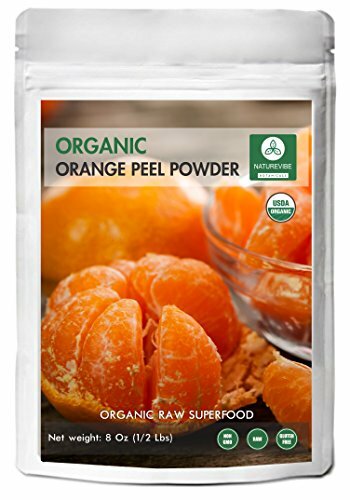 Organic Orange Peel Powder is slightly sweet and bitter, Helps in anti-ageing. 100% Fresh High Quality Herb treats acne, pimple and promotes skin health. Packaged in a FDA and USDA food resealable zip bag to ensure freshness and quality, Helps Headaches. The healthiest and the best source of vitamin C, Treats Digestive Disorders. Ethically harvested and processed in India, contains the zest of the Orange.